With a title like Crazy Rich Asians, we were fully expecting an ostentatious display of wealth in the movie replete with super cars, palatial mansions, mega yachts, lavish jewels, fancy wardrobes, and of course, a host of luxury watches. And we were not disappointed—particularly in the horology department. Among the host of high-end watches we saw in the movie, from Nick Young’s (Henry Golding) vintage Omega Seamaster DeVille (the actor’s own) to Eleanor Sung Young’s (Michelle Yeoh) diamond Richard Mille (the actress’ own) to Bernard Tai’s (Jimmy O. Yang) rose gold Hublot, there’s one that caught our eye. It was none other than a vintage Rolex Daytona “Paul Newman.” But how did the movie manage to source such an impressive (and authentic!) vintage Rolex watch to feature in a pivotal scene in the film? We can thank our friend Eric Wind for that. As Eric recounts in his story, the author of the book Crazy Rich Asians, Kevin Kwan, reached out to Eric for help with a “watch emergency” for a scene that was to be filmed in Malaysia in a few short days. The scene was to feature Astrid Teo (Gemma Chan,) aka “The Goddess,” gifting her husband, Michael Teo (Pierre Png), a watch after indulging in some very expensive jewelry for herself. After a few unsuccessful attempts to borrow a new watch from Swiss watch manufactures, Eric finally found a serious watch collector in Singapore who was willing to lend his very serious vintage Rolex to the movie’s prop master, Justine Dunn. The watch was a Rolex Daytona “Paul Newman” ref. 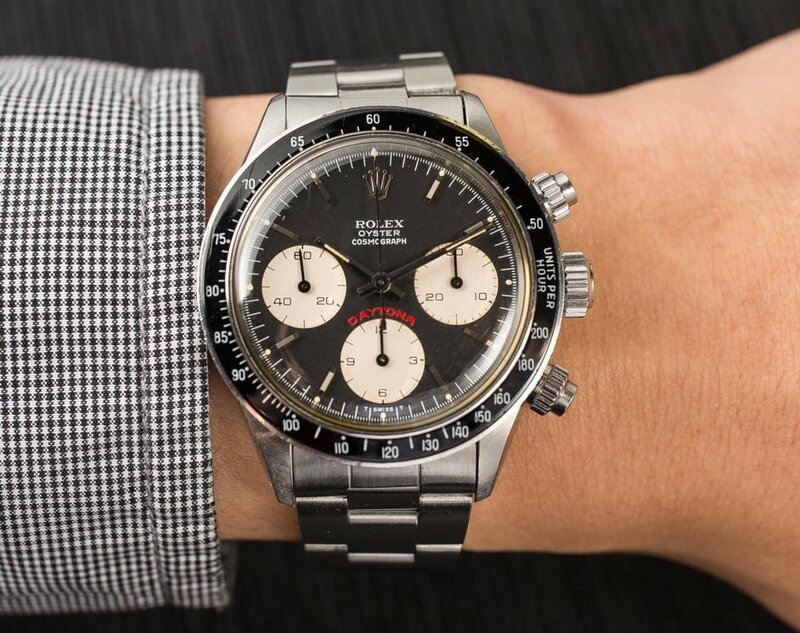 6263 with a Panda Mark II dial, also known as the “Oyster Newman” thanks to the Oyster text under the Rolex logo. While on set in May 2017, this specific Daytona model had a value of about $500,000, which has now ballooned to about $600,000. In another interesting twist to the story, the record-breaking $17.8 million sale of Paul Newman’s own Daytona “Paul Newman” took place after the filming of that scene. As a result, the Rolex Daytona that got its own screen time in Crazy Rich Asians is befittingly similar to the world’s most expensive watch ever sold at auction. Crazy, indeed.